The Every Other Day Diet (EODD) involves one day of normal eating alternating with one day of very light eating where dieters consume around 300-400 calories. It was designed by Jon Benson as a way for dieters to lose weight without dieting. He highlights the fact that our ancient ancestors never knew how much food they would get to consume on any given day, so they always varied their caloric intake, which kept them thin and healthy. Jon struggled with his weight all his life until he discovered this method of eating, which transformed his life for good. By eating normally every other day, Benson that dieters will be able to avoid the metabolism reducing effects of low calorie diets. 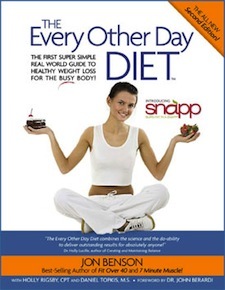 The Every Other Day Diet uses the SNAPP Method as the basis of the program. Food amounts are based on body weight, not calories. Your Favorite foods can still be eaten. Never eating the same amount of food each day. Following a nutrition plan not a diet plan. The EODD has some Paleo Diet aspects and is high in protein and low in refined carbs during most days. However foods like pizza and desserts are allowed during certain times and days only. The diet is designed to cause the body to burn fat stores for energy instead of energy from food sources. EODD claims 3x Faster Fat Loss than traditional low calorie diets. Benson claims that dieters will feel okay on the low calorie days because the design of the diet keeps the mineral and protein content high and this helps dieters to keep feeling strong. Over 40 pages of recipe are provided in The Every Other Day Diet as well as detailed meal plans that tell you exactly how and when to eat. There are no forbidden foods but the majority of foods recommended are based on protein, healthy fat and low carb criteria such as lean meats, eggs, low-fat dairy, nuts, seeds, green leafy vegetables, fruit, and fish. The following is a sample meal plan for the low calorie day. Jon Benson says traditional cardio is a waste of time and shows dieters how to use cardio to their benefit as well as emphasizes the importance of building lean muscle as a method to burn fat and speed up metabolism. These exercises can also be used with the EODD Diet. The Every Other Day Diet is available online for $39.97 and is available immediately after payment is processed. Click here to learn more or to get your copy. There is another very popular diet written by Dr. John Daugirdas called The QOD Diet, which espouses a similar concept to the diet reviewed on this page. It is suitable for those who prefer hard copies instead of eBooks. In addition dieters may need to purchase nutritional supplements including whey protein, fish oil and calcium/magnesium. But EODD has a whole section devoted to which supplements work and which are a waste of money. Scientific research on animals shows that this way of eating is promising for its potential to extend lifespan. May be easier for some dieters psychologically as there is only one day of dieting to stick to at a time. Since dieters can still have favorite foods, binge eating is less likely. Suitable for women, men, teens, and children. Deals with emotional eating and other issues. Many dieters may feel tired and have difficulty with normal activities on the low calorie day. Some dieters may have trouble only being able to have high carb foods on certain days. Not suitable for dieters with certain medical conditions. Consult your doctor before attempting this method. The Every Other Day Diet is a fairly simple approach to weight loss that is designed to vary calories each day so the body’s metabolism never adapts which can stall weight loss. Many have been successful with this method and dieters can still occasionally have their favorite foods while on the EODD Diet. The “paleo” type nature of this plan won’t appeal to everyone, especially those who don’t eat meat or animal products. I have not recieved my order for The Every Other Day Diet2.0 and 7 Minute Body Both are payed for At ClickBank order Numbers SQ3EZ8VT and SQ3EZ8GT dated 13 march 2010. Could I please have them sent thanks. Anne- The products are ebooks and you have to download them..they will not be sent. Check the email receipt you got from ClickBank for links. I paid for the book back in May, got nothing in return. Have contacted them, no reply. I paid $58. What a have. Do not order this, they take your money and send you nothing. Denice, This is an ebook and you have to download it from the internet. They never said they would send you anything. I believe in every other day diet, worked for me fast! eat one day Only RAW fruits! Nothing else! 2nd Day FOOD day !!! back to the Foods you were eating, YES like Burgers, Pizza ect….Repeat this one day on and one day Off…you will Lose 1-2 lbs every other Day ! Trust Me,…No need to buy anything….if you want to know more …e-mail me ,…..on any questions…. Lisa, I understand that you have had your own success and I am happy for you, but no one thing works for everyone. I personally have worked several diet schemes in the past, and it wasn’t until I was heavy exercising twice a day 6 days week (mixing 3 mile runs with hour+ aerobics classes) that I started to see improvement. As well as being a male of 6 feet 4 inches 280lbs and only taking in enough calories to sustain my high paced schedule. I lost 50 lbs in less than three months, but it wasn’t the sort of plan that had reasonable sustainability, which is why I am here tonight. The key for all of us ultimately is to find a plan that is effective, and most importantly sustainable. Just like with my case, I dropped 50 and put it back on because I couldn’t sustain that lifestyle. This whole thing is more of a lifestyle change than an image change. If you are unable to change to a lifestyle that you can live with, then you will fall right back into the pit just like I did. In short, the way that works for you doesn’t work for everyone. We all need to find what works and help each other in doing so. I personally LOVE the every other day diet! I lost 35 pounds this last summer when i was 10 years old! I just turned 12 and has gained quite a bit back, but I still look good, but its pretty noticeable. I gained because of the holidays! Lots of cooking! So, none of these other diets were working, so i came across an idea of this and looked it up online, and came across this diet, and in just less then one week, lost 2 pounds!! Not very much, but a good start! 1stly, people this is REVIEW site, not one trying to sell you anything.. and 2ndly, I have had a look a the actual site that tries to sell you the diet, and very quickly got tired of the various pages you go through, I gave up without even seeing theprice, i can’t believe some make it the whoe way through to purchase stage.. seriously, if you want to lose weight, it’s simple, eat less, do more.. try and base it round the two fruit, 5 veg idea, add some protein, and the occasional treat. You’ll feel and look better. Here’s my PERFECT DIETt: Eat a breakfast (NORMAL) egg/toast/liquid, or 3/4 cup cereal, or fruit and toast, Lunch: sandwich/drink or salad/drink, or soup/drink heres Supper: meat/veggie/starch/a drink, if you choose pizza have two slices ONLY and a one drink ; then if you are starving after seven, go have a fruit cup, or toast, or 1/2 cup cereal. Between this all WALK anywhere, somewhere 30-45 minutes, slow, fast , whatever….move. THE END. Let me know how you do. Oh, and if you HAVE to have an outing with friends eat 1/2 the meal with 1/2 desert…JUST an FYI you may not loose that day or week. 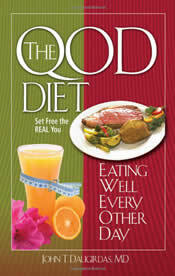 If you just have questions about this diet, DO NOT PAY TO GET THE ‘BOOK’. Once you receive the information, they don’t care that you are not interested. If EODD really felt that they have a good program, they would allow people to bail and happily refund their money so only those that do wish to continue this diet submit comments. Please cancel my subscription and refund my payment. @Doris, sorry this is just a review of the QOD plan, you will have to contact the company you signed up with if you would like a refund. Wow, glad I read comment section, almost fell for it myself today. I am typing this on January 26, 2010 and there is still a website. I reached it by clicking on a link on the Octomom website…go figure. Think I’ll save my $39.00 now that I’ve read about it. Remember there are several versions of this diet out there…this review is not on the scam one, but a the QOD diet which isn’t a scam…. I signed up and paid $39.97 on 11/18/09. I find I can not do what is asked of me and have only lost a few pounds. Can I still get my money back? @Carol you will have to contact the website where you bought the diet from, everydiet.org is just a diet review site and we do not sell products. Really? I was hoping to find some actual REVIEWS! Is every person on here (besides ted) completely computer/internet illiterate? This makes sense to me because it is similar to the way I’ve lost weight on my own over the last 4 years, going from 242 to 175 and still loosing. We are socially conditioned to eat 3-4 times a day, doing it by the clock instead of by what our bodies need. I started listening to my body. When my body wants chocolate, it gets chocolate, just not the whole huge package. This makes sense to help you re-program your thinking. Mike, this is a review page, and not the place to get in touch with diet merchants. Please go to the merchants site directly. I want to know if the EODD will work for me, I celiac and follow a gluten free diet…. @patricia, You’ll have to contact the every other day website. This is everydiet.org and it’s just a diet review site. Best wishes! Is Barbara Stribling really that stupid to think this is where she gets the refund?? Really?? Send me your phone number. Cancel my order VE2BBCCM. My doctor says this diet is inappropriate for me. I ordered it on Nov. 28, 2009. As per your guarantee, please reverse the charge to my credit card. @Barbara- This just a review of the diet, you’ll have to contact the company if you want your money back. Users need to beware: there are different versions of the every other day diet. There’s one by Jon Benson, there’s the one featured on this website, and there’s a version out there where you eat what you want on one day and eat nothing but water the next day, rinse, and repeat. For those of you who have ordered something or the site has disappeared, make sure you are trying to contact the right site/source, etc. ; not that I’m trying to defend anyone. Well it appears I am yet another sucker…as I also succumed to the hype and bought into the EODD system and find that the website no longer appears to exists. Does anyone know what to do next?? ?/ How do I/can I retrieve my money. This EODD website is totally GONE! Cannot find it ANYWHERE. Every url that directs to it has a “Sorry – nothing here” or something similar phrase. Sure glad I did not buy. Can you count fats in place of calories? Eat almost no fat every other day and a regular amount ever other day? On the low calorie day, do you still drink water? If so, how many glasses a day? I have just ordered through your website but was not requested for my address details, how will I receive my order? @Pat, sorry you’ll have to contact the every other day diet directly, this is just a review of their program. of coarse vegetarians can do it. we can do anything :). ha. you could substitute low fat cottage cheese for meat, it’s really high in protein. Can vegetarians do this? What can ham be substituted with? Yes Substitute tomatoe juice for Orange juice! That is the best way to do it! No. Tomato juice has a low glycemic index, less shugar which turns into fat. You may be able to do carrot juice, as long as its not mixed with a fruit. can you subsitute tomato juice for apple or orange?